US Consumer Price Index, coming up!!! US Consumer price index ex food & energy data for December is coming up today. 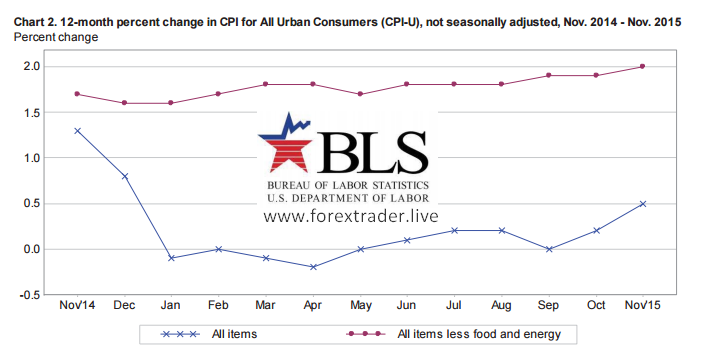 The CPI for all urban consumers (CPI-U) was unchanged for November on a sesonally basis and over the previous 12 months, the all item index increased 0,5% before sesonal adjustment, which was the largest increase in the previous 12 month period ending December 2014. The index for all items les food and energy rose 2,0% its largest 12-month icrease since the 12 months, ending May 2014. 13:30 h (GMT) – CPI ex food & energy (YoY) Dec. > Previous 2,0% > Expectation 2,1%!!! Update > 2,1%! 13:30 h (GMT) – CPI (YoY) Dec. > Previous 0,5% > Expectation 0,8%!!! Update > 0,7%! Possible high volatility on the USD pairs!! !